Man’s discovery of fire helped us to sever some of our remaining simian ties, opening up not only the possibility of warmth and protection, but a whole world of sustenance that was heretofore either unavailable or unobtainable. However, man soon found ways to shop online, and what was once simple became suddenly and infinitely more difficult (after all, dear friends, the years between fire and Etsy are, relatively, not that far removed from one another). Of course, we as a race have progressed so have our tastes, and, in general, we are no longer content with simply cooking our meals, we now have to enjoy them. “Edible” is no longer the deciding factor in consumption, and our burgeoning taste buds demand multiple levels of flavor, along with that classic one, “not-poisonous.” Being “higher beings” we no longer simply have to survive, we have the luxury of choosing what we eat, which is often a problem for those with expensive tastes and irresponsible tendencies (fledgling bank accounts). So, to address this issue I’ve prepared The Irresponsible Girl’s Guide to Discount Dinner Parties! Issue #1: Everyone goes crazy over fall themed cuisine, so I wanted to too—bandwagons are exciting and usually have some kind of truth at their core. But, a lot of fall fare is expensive. Pumpkins and walnuts and the like are budget breakers—when your budget is $7. But this is not the end off your pumpkin-flavored dreams, dear readers; there is help for you, for me, for US. One can coconut milk – $1. Pre-heat oven to 400 degrees. 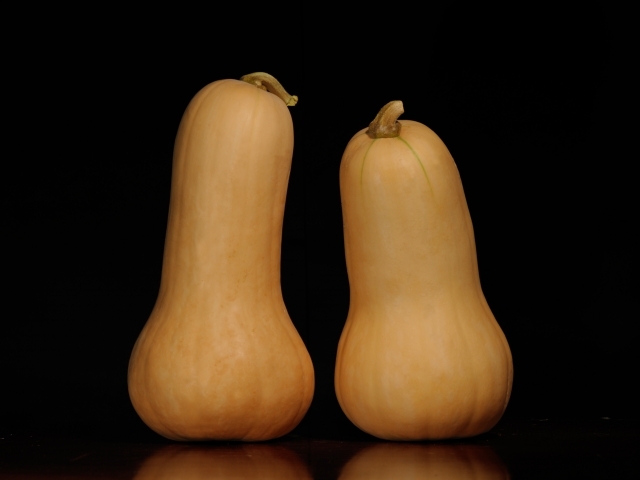 Start off by cutting the squash in half lengthwise and scooping out the seeds, making sure to save them for later. Place the halves on an oiled cookie sheet, cut side up. In the meantime, wash the rest of the pulp off of the seeds and place into a small bowl. Add about a teaspoon of olive oil, pinches of salt, pepper, garlic powder, and rosemary, and transfer the seeds to an oven safe dish. Put in oven. Forget for 15 – 20 minutes. Next: cut the onion, garlic, and ginger, only add the onion to a pot (this is your soup pot, so make sure it’s BIG) with about a tablespoon of olive oil and sauté over medium to low heat. Cook for about 5 minutes then add the garlic and ginger, then cook for another 5 minutes or so. Add coconut milk and vegetable broth, turn off heat and cover until the squash is ready (you should be able to easily cut through it with a knife/fork). Once the squash comes out of the oven you can either wait for it to cool (ugh, so long), or you can be a MAN and scoop it out with a giant spoon while it’s still lava hot—that’s up to you. Also, at this time you should check on the seeds to make sure they’re not burning. They should be browned but NOT black. Add the squash to the mixture in the pot and bring to a boil. This will look disgusting. It’s ok. Stir a bit and then taste for salt/pepper additions. Add to your own preference. Either use an emulsion mixer or transfer the infant soup to a blender, being careful to only fill it about 1/4 of the way (experience reminder: hot soup HURTS). Blend for 30 seconds and dump into a waiting pot/giant bowl/whatever. Repeat for the rest of the soup. Remove the seeds from the oven if you have not already done so. Ladle soup into bowls, sprinkle top with seeds. Yell “soup’s on.” Wash a million dishes, then go to the bar with all the money you’ve saved. 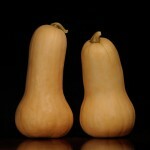 squash in oven, can’t wait to eat it!